Quickie Faux Phớ is the next best to the real thing when you're short on time. 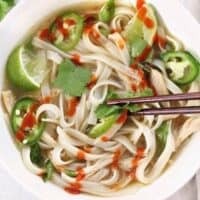 Hot broth, tender noodles, and tons of fresh toppings! Add the chicken stock, five spice blend, and chicken pieces to a large pot. Bring to a boil over medium-high heat. Add the noodles and continue to boil until tender** (about 4-5 minutes). While the noodles are boiling, slice the jalapeño and green onions, and cut the lime into wedges. Spoon the broth, noodles, and chicken into four bowls. Top with a couple wedges of lime, a few slices of jalapeño and green onion, and a few sprigs of fresh cilantro. Serve with sriracha and hoisin on the side. *Use the best broth or stock available. Since my stock was made with scraps and nearly impossible to estimate the cost, I used the price of the store bought broth that I usually use (Better Than Bouillon). **If you plan to store your soup in the refrigerator, cook and store the noodles separately from the broth. To serve, just place some noodles in the bottom of each bowl and ladle the hot broth over top.